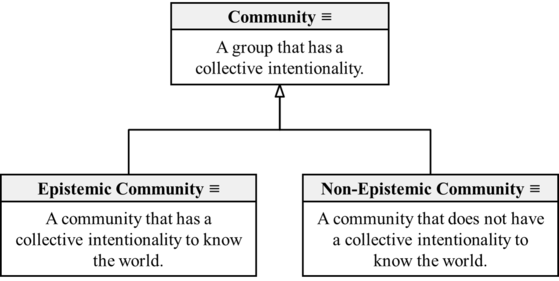 Provided that the definition of community is accepted, accept new definitions of epistemic community and non-epistemic community as sub-types of community. The modification was suggested to Scientonomy community by Nicholas Overgaard on 19 May 2017.1 This modification presupposes the acceptance of Sciento-2017-0012. The modification is currently being evaluated; a verdict is pending. Epistemic Community (Overgaard-2017): A community that has a collective intentionality to know the world. Non-Epistemic Community (Overgaard-2017): A community that does not have a collective intentionality to know the world. Epistemic Community: What is epistemic community? How should it be defined? I.e. how is it different from non-epistemic community? Non-Epistemic Community: What is non-epistemic community? How should it be defined? I.e. how can it be differentiated from epistemic community? This page was last modified on 21 May 2017, at 13:12.